Do you need a dust mite bed cover? Ask yourself these questions. Is your house really clean? Do you sweep and mop regularly, change everyone's' sheets regularly, and practice good personal hygiene? I hope you answered yes to all of those questions; if you did, good on you. However, when fighting the never-ending battle with dust mites, simple cleaning is not enough. You need to know what are dust mites before you can begin to fight them. Did you know that there are about one million dust mites burrowing their way into your mattress and pillow as we speak? And each female mite lays up to 100 eggs in her short lifetime. That's up to 100,000,000 dust mites that are born, live, defecate and die in your bed each month. Not a nice thought, is it? Why do they live there? You may wonder. The answer is simple, each week, the average human sheds around 10 grams of skin and hair particles; which just happen to be the absolute favorite food of the common house dust mite. This matter is known as dander, and try as we might, there's not a whole lot we can do about shedding it. Dust mites are living in your mattress, day in and day out, going about their filthy little lives as we naively believe that we are slumbering between clean, fresh sheets. But there is a way to protect ourselves from being covered in millions of tiny, microscopic arachnid-like scavengers each and every night. Dust mite bed covers are made of a thick, tightly woven material, so tight in fact that there is no space between threads for any creature, no matter how small, to squeeze through. The average 10-year-old mattress doubles it's original weight after filling up over the years with billions of living and dead dust mites, and of course their feces. Try as you might, you simply cannot deny that they are there. Dust mites are almost everywhere. A dust mite bed cover and dust mite pillow covers are the only way to make sure pesky little dust mites keep out, and stay out! Dust mites are not only dirty and unsanitary, but many Americans have alarming allergic reactions from simply coming into contact with a dust mite or fifty. So many cannot explain why, when they retire to bed each night, they wake up in the morning with a sore throat, itchy eyes and a stuffy nose. No, folks, you're not getting sick. Odds are, you have a severe dust mite infestation. If this is the case you need to learn how to get rid of dust mite bites. A dust mite proof mattress cover can stop all of this. Regular washing of sheets may seem to keep them clean. This is part of a great dust mite prevention plan. However, soon as they are back on your bed, in march the writhing, gnawing, defecating masses to cause you more discomfort and unrest. As if that's not bad enough, not only do dust mites affect adults, their affects are far stronger in babies, children and the elderly. Dust mite contact can cause a red, irritated rash on the skin, which is not only uncomfortable and unsightly, but can lead to an infection or more serious condition. Along with this, breathing in the airborne allergens that accompany dust mites can be very dangerous. Once inhaled, these allergens attach themselves to the walls of the lungs, and suffocate the healthy tissue causing permanent damage. Even if your mattress is years old, giving at a good wash in cold water and then applying a dust mite bed cover can save you all the sleepless nights and blurry, irritated mornings. 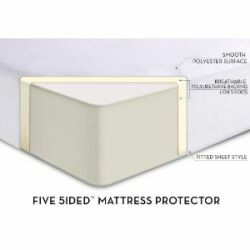 However, even if you don't have the time to wash it and kill dust mites, once the dust mite bed cover is secured, none of the little buggers can get in or out, assuring that you have a restful, bug-free nights' sleep, safe from any type of allergic reaction, skin irritation, or dust mite bites. Leave Dust Mite Bed Cover Page and Return to What are Dust Mites Page. Leave Dust Mite Bed Cover Page and Return to All About Air Purifiers Home Page.